Jose Gonzalez’s music sounds removed from space and time. The Swedish singer/songwriter’s sparse acoustic musings, set forth into the world over the course of just three LPs since 2003, comprise an ageless and enigmatic world of their own. During Friday’s sold-out show at the Berklee Performance Center, it was a world that his adoring audience was more than happy to follow him into. Gozalez’s current tour is a collaborative effort with the New York-based chamber music sextet yMusic, who also opened the evening with their own set. Amid cello and violin, trumpet and French horn, yMusic explored moods ranging from playful to ethereal in both their original compositions and those of friends. 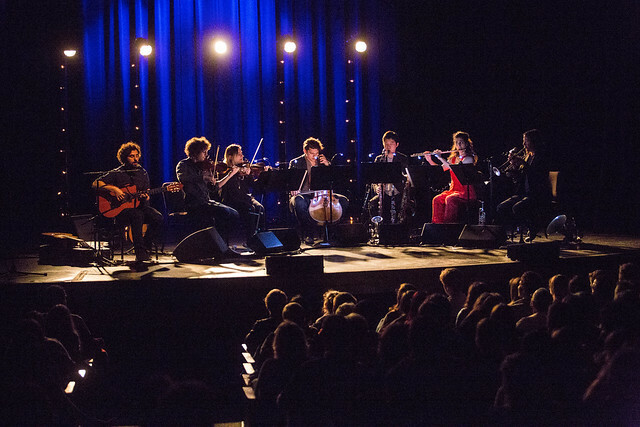 One uniquely engaging piece by a collaborator was said to be inspired by the sounds of an air conditioner – apparently a solution to classical music writer’s block – and the set concluded with an inspired interpretation of an early-career electronic work by none other than Sufjan Stevens. Following a brief intermission, Gonzalez took the stage alone and opened with “Stay in the Shade” from his 2003 debut Veneer. To say that there was a pin-drop silence in the audience would be an understatement, and for this first portion of the set Gonzalez entranced with nothing more than delicately picked strings and wistful voice. Aided no doubt by the room’s exquisite acoustics, Gonzalez’s guitar rang with a rich and intricate tone that could often trick one into hearing instruments that weren’t actually there. Even with a minimal stage presence save for a humble “thanks” now and again, Gonzalez had no trouble keeping an audience of 1,200 in the palm of his hand. That audience surely wouldn’t have complained had the remainder of the night proceeded in just this fashion, but the addition of yMusic following a selection of solo tunes succeeded in complementing Gonzalez’s talents rather than distracting from them. For the work of seven musicians, the arrangements of songs spanning Gonzalez’s discography were remarkably subtle in their execution. The songs were expanded with flourishes of strings and brass but still given room to breathe, honoring the pensive spirit of the originals. A jazz-inflected cover of Arthur Russell’s “This Is How We Walk on the Moon” offered a lively mid-set changeup, and Gonzalez’s beloved, heartrending rework of The Knife’s “Heartbeats” at its close was made all the more lovely with accompaniment. Gonzalez’s songs don’t come across on record as needing that accompaniment, and indeed the solo portion of the show proved their ability to stand on their own, but yMusic’s presence offered an intriguing alternate angle on his songbook. Together, they rendered a gorgeous evening of music.